Many common products contain chemicals that can be hazardous if used incorrectly. Consumers should understand the risks and practice safe use of products that contain chemicals to avoid serious injuries. Each year in Australia, about 2 000 children are hospitalised because of poisoning, with children aged between one and three most at risk. This makes poisoning the second most common reason young children are admitted to hospital. In addition, in Australia more than 200 000 calls are made annually to the Poisons Information Centre. Many household products contain chemicals which are potentially poisonous, such as cleaning products. 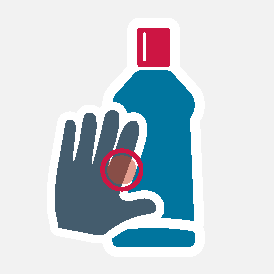 Care should be taken when using and storing these products to prevent poisoning incidents. Contact the Poisons Information Centre on 13 11 26 for assistance in the event of poisoning. Allergic reactions occur when a person’s immune system reacts to substances within the environment. There is wide variety in people’s susceptibility to different allergens. Food labelling regulations apply to allergens in food. However, chemicals commonly found in consumer goods are also associated with allergies. Allergic reactions can result in a range of symptoms, including inflammation of the nose, eyes, sinuses and throat (allergic rhinitis), redness and irritation of the skin or hives (uticaria), stomach upsets and in some cases life threatening anaphylaxis. First aid for an allergic reaction will usually include removal of the allergen and treatment of the symptoms. Some chemicals can cause burns, particularly if they are strongly acidic or alkaline, or have highly reactive solvents or high oxygen content. The eye area is particularly sensitive to chemical burns. Burns to the eye area can occur through a splash or spray, or as a result of a person rubbing their eyes with their hands after using chemicals. The injuries can be serious. Chemicals continue to damage tissue as long as contact occurs. First aid for chemical burns usually involves immediately removing contaminated clothing and irrigating the area with water to remove the chemical from the skin and dilute the residue. First aid providers should ensure that they use appropriate protective equipment to prevent contact with the chemical contaminant. Contact the Poisons Information Centre on 13 11 26 for assistance with a chemical burn. Contact dermatitis is a type of skin irritation, which results from contact with an allergen (allergic contact dermatitis) or other irritant (irritant contact dermatitis). Contact dermatitis is often treated with cortisone or other medicated skin creams. Seek medical advice if you are suffering from contact dermatitis and are concerned about it. Always read and follow the instructions when using products containing chemicals. Ensure you understand any warnings that appear on the package and take appropriate precautions. Always wash your hands after using the product. Make sure containers containing chemicals are labelled and stored in a safe place out of reach of children. Ensure you have appropriate first aid supplies at hand in case something goes wrong. Contact the Poisons Information Centre on 13 11 26 for help and advice.